The entire Cleckheaton RUFC junior section gathered for a group photo in their respective kits with players from the Micros up to the Senior Colts represented. Cleckheaton RUFC held their annual presentation day for their junior section ranging from their little Under-6 Micros team up to the Under-12s. The club also managed to get all Cleckheaton’s junior players together for a picture of the different age groups in their match kits. 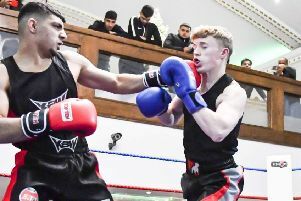 The Micros begin for children aged five years old and upwards, while Cleckheaton run teams all the way up to their Senior Colts at Under-18s level. Cleckheaton also have a newly formed girls team. The presentation saw all players receive trophies for their outstanding efforts this season, with overall team of the year going to the Under-8s. The Reporter Series has followed the Under-8s team throughout the season as they have improved from a struggling side at the start of the campaign through to them going on a terrific unbeaten run in 2017 to the delight of coaches Kev and Adam. Freddie Rhodes claimed the 100 per cent effort award, while Jenson Senior was the Under-8s most improved player. Samuel Hemmingway was players’ player of the season and Stanley Piper scooped player of the year. Training continues throughout the summer as the team prepares for moving up next to Under-9s season when tackling will be introduced in place of tagging . New players are always welcome throughout all the age groups and more information is available by visiting the club’s website at www.cleckheatonrufc.com. The club also thanked volunteers, coaches, team admins, first aiders and match officials.